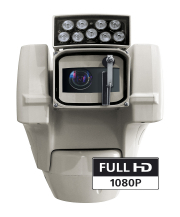 Videotec’s Thermal Cameras allow a clear vision in total darkness, fog, rain or dense smoke. They’re especially suitable for demanding high security applications, including the maritime surveillance, automotive and rail traffic, the fire detection and many more. The thermal camera is an uncooled Vanadium Oxide (VOx) Microbolometer with a spectral band of 7.5-13.5µm; it generates a thermal video of 320x256 (PAL) or 640x512 (PAL), with a frame rate of 8.3fps or 25fps (PAL). High sensitivity (50mK at f/1.0) guarantees excellent thermal vision. Supports 2x or 4x digital zoom. Various focal lengths are available, depending on the detection distances required. The camera also has functions such as the Isothermal analysis (special colors of the objects that fall within the parameters set by the operator), base thermography and other colors of the scene. They are housed in rugged enclosures made of aluminum or stainless steel which provide total protection against extreme environmental assaults. The windows are made with special Germanium glass, that with its exceptional features, allows the best transmission of energy from 7.5 up to 13.5μm.